For many people the home bar with well stocked bar cabinets is the height of luxury and gracious entertaining. In the present cocktail revival the familiar ideal of a host or hostess presiding behind a stately bar suggests a certain level of civilization and generous welcome. To move that image from the ideal to the real, however, demands careful planning. Establishing an in-home bar is not something to take on lightly. As with any luxury the details of the design should be kept simple and functional, and the execution should be spare and flawless. If you are not a professional-level woodworker or cabinet maker you will probably want to make use of kits or premade items rather than risk the appearance of sloppy amateur work. Fortunately the home bar depends on elements drawn from kitchen and bathroom supply in any case. Given the huge variety of equipment and cabinetry available that allows even a beginner to put together a set of bar cabinets and bar and sink elements that would rival the work of a professional contractor, if not that of a true master-level cabinet maker. The first places to go are a kitchen remodeling contractor, a library, and a large hardware store or big-box chain with a substantial kitchen and bathroom area. Leave your wallet at home: right now all you are doing is getting ideas based on things you like, remodel jobs that appeal to you, and available materials. You should come away with many ideas for your bar installation and your cabinets. But be careful: it is easy to go overboard. The best design is almost always one that is simple and straight forward, with only a small number of carefully selected eye catchers. Consider the possibility of a small sink painted in the fashion of Mexican Talvera tiles, with a solid brass sink fitting and matching glazed handles and pulls for the otherwise simple bar cabinets. and it will all be simple, easily purchased, and on the whole fairly cheap. Bar cabinets are much less complex and demanding than kitchen fixtures. A bar needs lower cupboards and shelves and a counter, and it needs shoulder-high cabinets and shelves. If it is a wet bar it will need a sink and plans must be made to provide plumbing, hide it, and yet keep it easily accessible in case it should need repairs. In many instances a small portable refrigerator with a tiny freezer will be welcome. Leave room for that single item: the fridge cant supply all the cooler space and ice for a large party, but for a small two person happy hour it will prove more than sufficient. 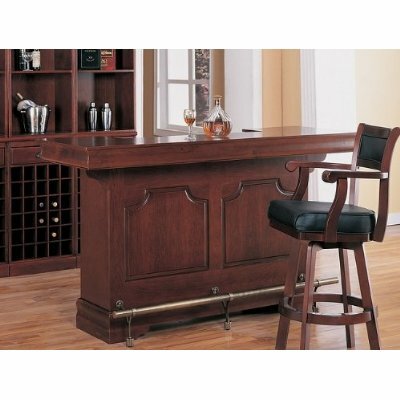 Home bars and cabinets can never rival a large and well-maintained professional bar from a tavern or a good restaurant. Economies of scale put that kind of overstocked opulence out of most peoples space allotment, much less their financial allotment. By thinking the project through and planning it carefully, however, you can have a pristine and elegant bar of your very own, to enjoy with friends, or on quiet evenings with your significant other and a best buddy or two. Go to sitemap page for all pages listed on finishcarpentryhelp.com..
Return From the Bar Cabinets Page to Home - Finishcarpentryhelp.com.